Set up a WordPress.com website/blog and learn how to use it over the course of the day. All delegates leave with a book, featuring all aspects covered on the course. Learn how to plan a successful website or how to improve an existing one to benefit users and success in Search. The basics – Domain names, hosting and E-mail. Defining objectives for your site. Defining target markets and how to plan your website to benefit users. Calls to Action – what they are and where to place them for best effect. Policies and standards – the importance of adopting best practice. Responsive design and functionality – how will people view your site, what do you need to be aware of in 2013? Development options DIY, Fremium, Open Source, Developer? It’s not just the website that needs to work to achieve business success online, but also a blog and social media networks. How to go about this will be covered in this one-day course. 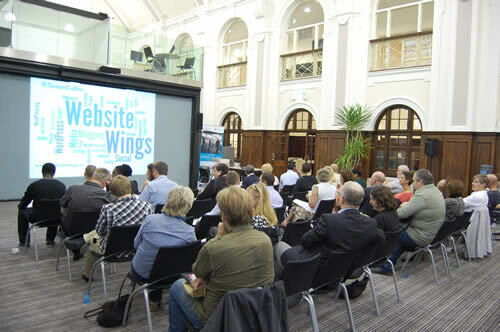 For more information and to book a place on Developing effective web content visit the eBusinessClub website. Need help with learning about blogging for business or how to set up and use social media networks like Twitter, LinkedIn and Facebook for online marketing? I can provide practical support. Whether 1:1 coaching or delivering a workshop, I help businesses learn how to harness the power of using website, blog and social media in an integrated way for successful online marketing. You can contact me for a chat about what help I could provide, or send a voice message using the SpeakPipe on the right of this page. If you’re mainly interested in social media training only then visit Wings Academy where you’ll find a variety of support options available. If you can’t attend the above courses here’s some alternative ways of how I could help you develop effective web content.